IAM Local 219 members on strike at Allsource Global Management in Bluegrass Station, KY receive full Thanksgiving dinners donated by IAM Districts 27, 711 and 75. About 135 IAM Local 219 families at Bluegrass Station, KY have been on an Unfair Labor Practice Strike against government sub-contractor Allsource Global Management (AGM) since October 1. As the holiday season approached they stood tall and proud at their Local Lodge meeting Monday, November 24 when the Local leadership distributed a full Thanksgiving dinner package to each family, including a turkey, sack full of fixings and pumpkin pie. 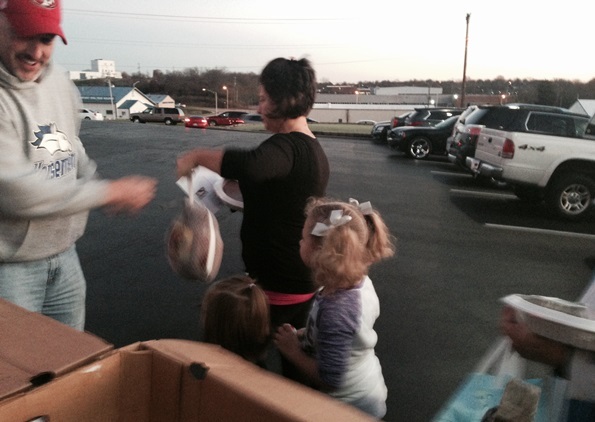 District 27 of Louisville, KY, District 711 of Nashville, KY and District 75 of Enterprise, AL provided all the food. Many IAM and TCU locals across the nation are donating to help this local weather the Unfair Labor Practice strike. You can follow and like the Local 219 Facebook page at www.Facebook.com/IAMLODGE219.